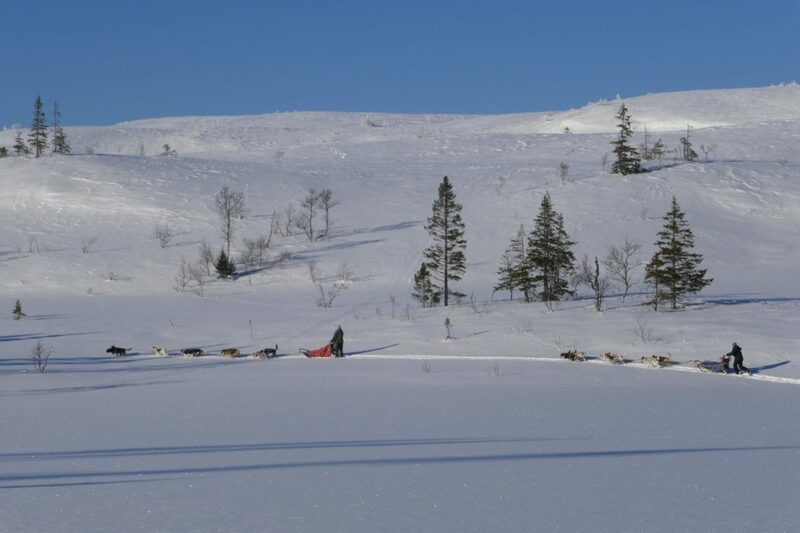 Tania Noakes is back from skiing Norge På Langs which is the full length of Norway. 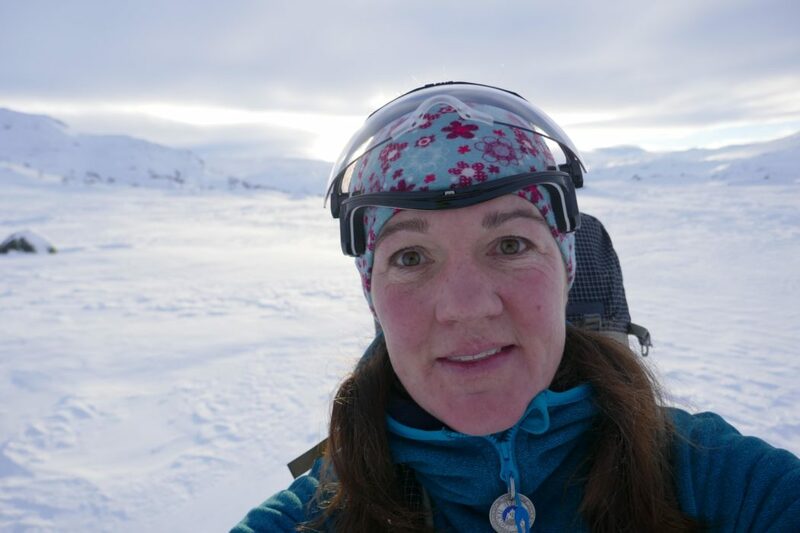 Here, she tells us what she learned and how chocolate helped her to complete the epic challenge. What have you done since finishing your adventure and how are you feeling? 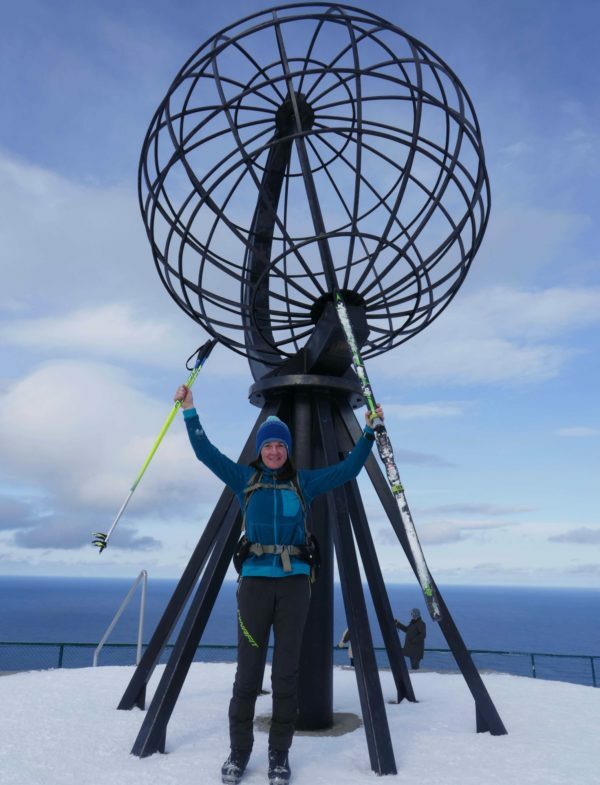 When I arrived at Nordkapp I was on such a high, so happy and full of energy - I hadn’t allowed myself to believe that I was actually going to finish until the very last couple of kilometres. There was so much uncertainty for me right up until the very end because there had been so much snow this year. 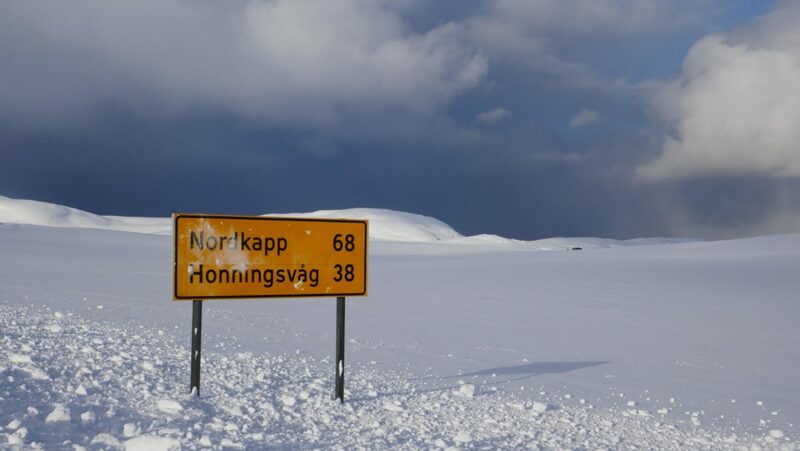 Honningsvåg, the last town before Nordkapp, had been cut off for ten days and avalanches had severed the coastal access road. When I finally stopped skiing I confess I was feeling pretty tired. Not the sort of exhaustion you feel after a big race but my body felt used, that’s the best way I can describe it. Like I’d been stringing together too many long days, carrying too heavy a rucksack for too long and not giving myself enough rest days - I basically wasn’t recovering as well as I normally do. It’s now over a month since I finished and I’ve had a good rest and have started training again. It feels good to get back into the mountains and all traces of that heavy fatigue have gone thankfully. There was a slightly surreal finish to my adventure though. Did the challenge live up to your expectations? Oh my goodness! It surpassed my expectations in almost every respect… I have trouble describing how good it was for me without grinning from ear to ear and getting as excited as I was whilst on the journey itself. It was a journey that I had dreamt about and been planning over the course of many years - it’s not just something I woke up one morning and decided to do. The fact that it meant so much to me helped when conditions were tough, when I was tired and had to make difficult decisions… it made even the unpleasant bits enjoyable in a very personal way. I agree with Nietzsch when he said “those who have a why to live for can bear almost any how”. 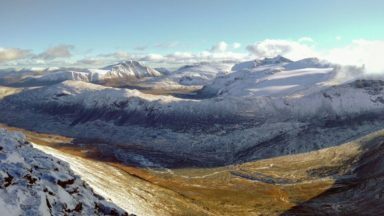 This year I was also incredibly lucky with the weather and snow conditions. 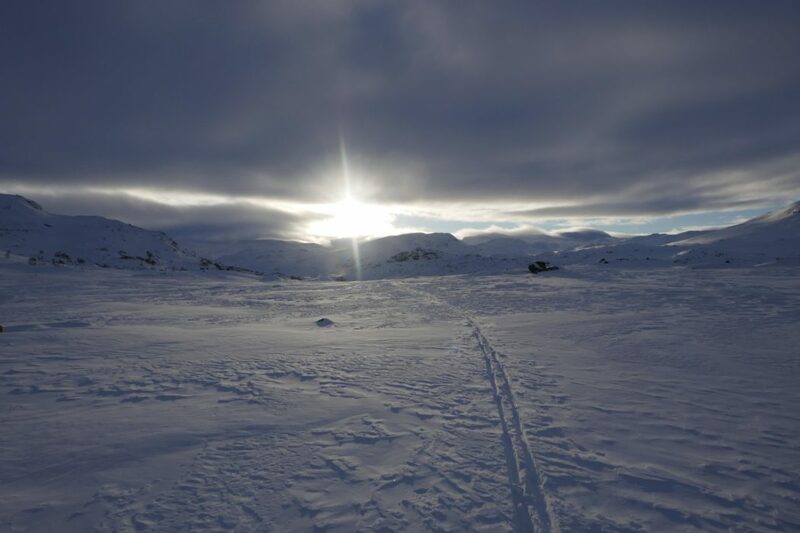 It was so cold for so long that I skied on winter snowpack for the entire length of Norway… it never rained on me. I had taken my waterproof rucksack cover, convinced that it would be mild and rain - but it never did! It was also much less windy than it normally is in Norway. 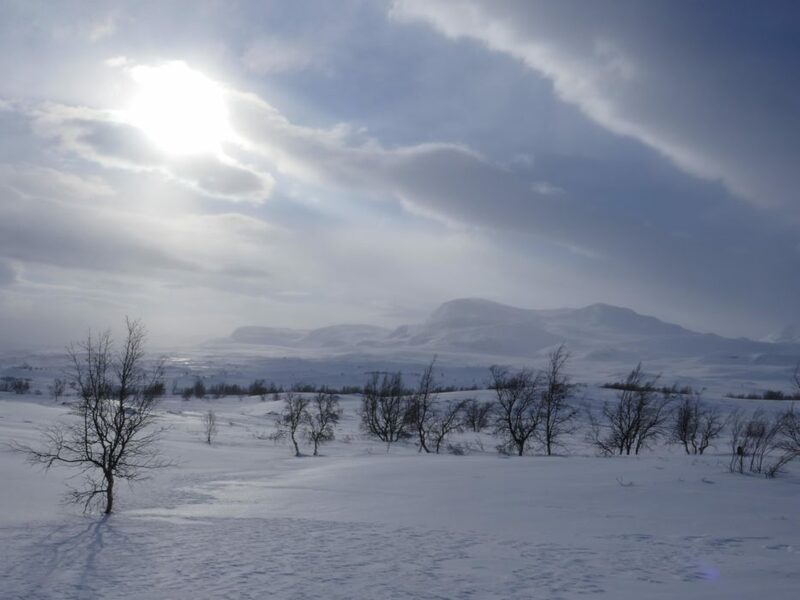 This year the prevailing air mass was largely from the East, that famous “beast from the East” as it was called in the UK. Did anything go wrong and how did you adapt? I feel very fortunate that almost everything went right for me on this adventure. 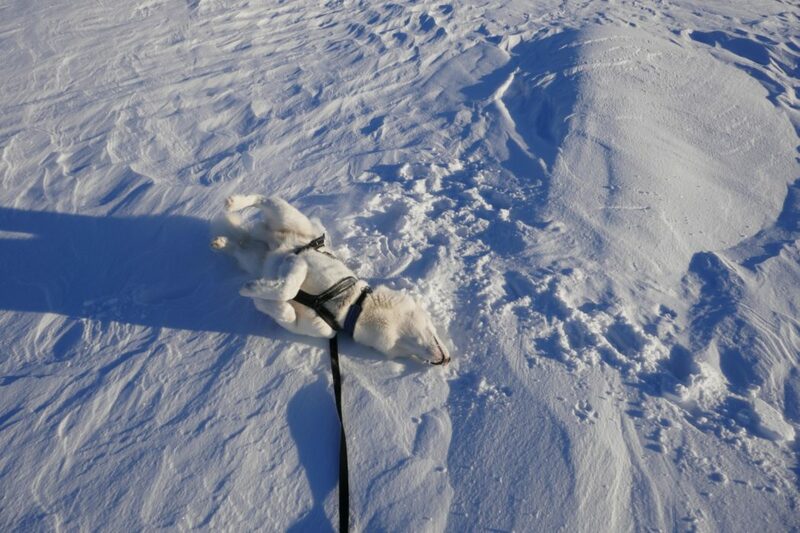 My biggest setback was just north of Abisko when I encountered deep unconsolidated bottomless sugar snow. It basically stopped me in my tracks and I had to admit that I wasn’t going to make any kind of realistic progress through that mountain range in those snow conditions. The snowpack there was very unstable and it was avalanche category 4 when I went through that area. 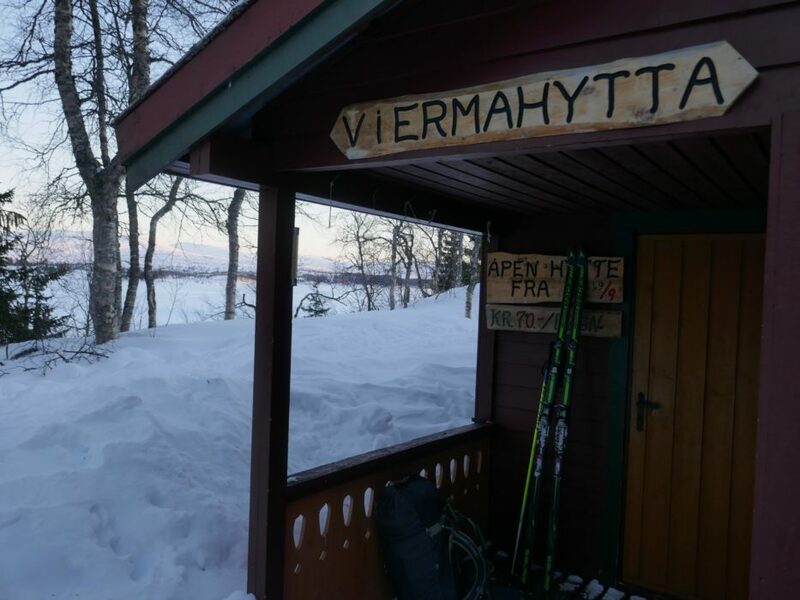 The first hut north of Abisko that I tried to get to (Lappjordhytta) involved some complicated terrain breaking trail through this snow and it took me 2 ½ hrs to make 2km. 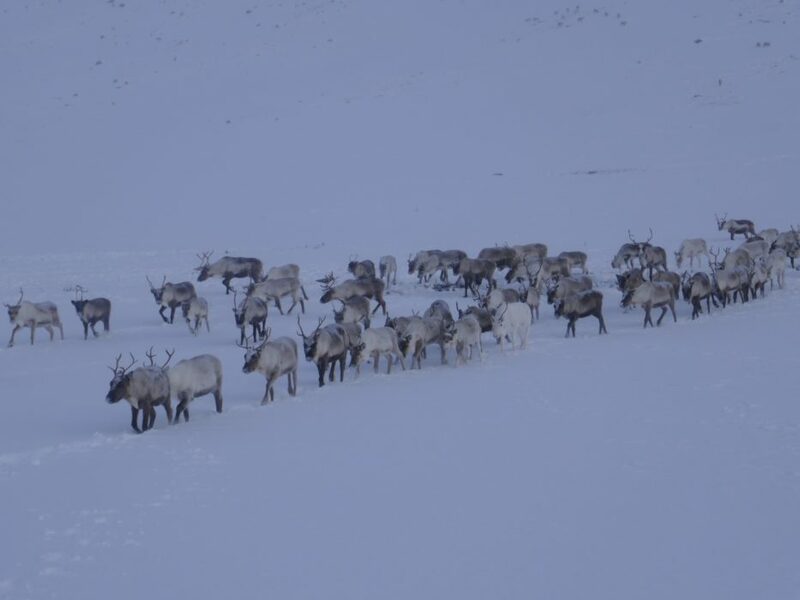 I turned around two kilometres from the hut. I was so close I could see it, but it was utterly exhausting. 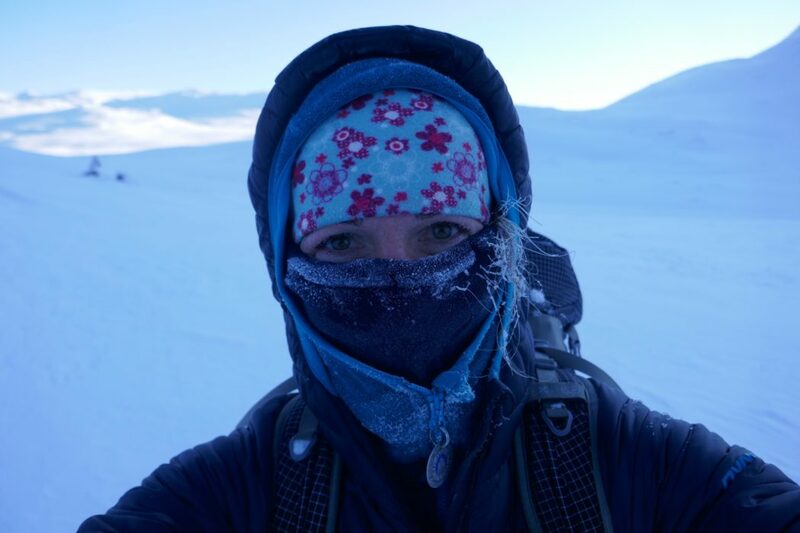 It was the first time that I had had to turn around and admit defeat due to the conditions - and trust me I had pushed myself really hard that day to try and make it possible. 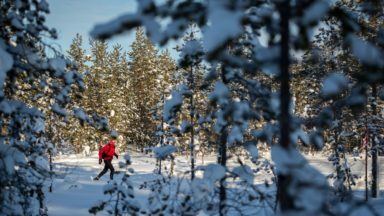 But some snow conditions are simply too exhausting, particularly if you don’t have anyone to share the trail-breaking with, no matter how fit and strong you are. 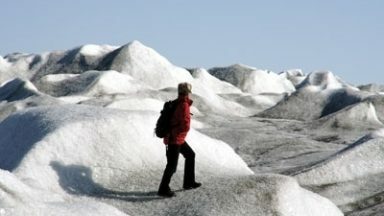 It was frustrating, but when I retraced my steps I soon discovered that I had another problem. 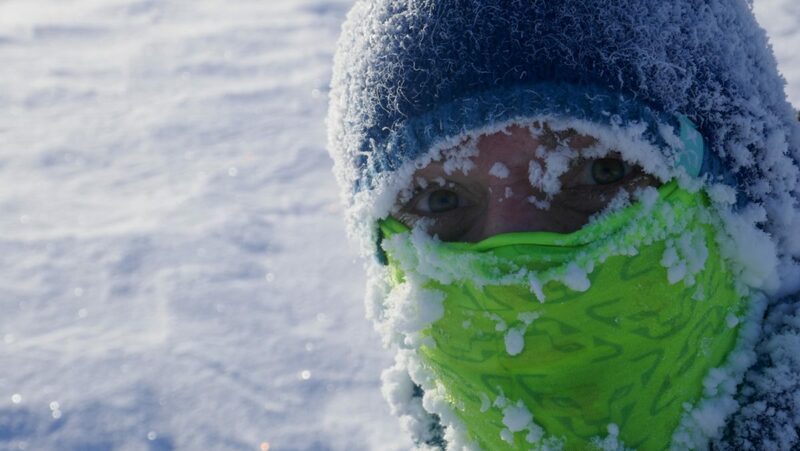 The snow had been so deep that I had been pulling up my feet and skis to free them from the snow and move forward. This had put a lot of pressure on the soles of the boots and had ripped the soles away from the leather upper. 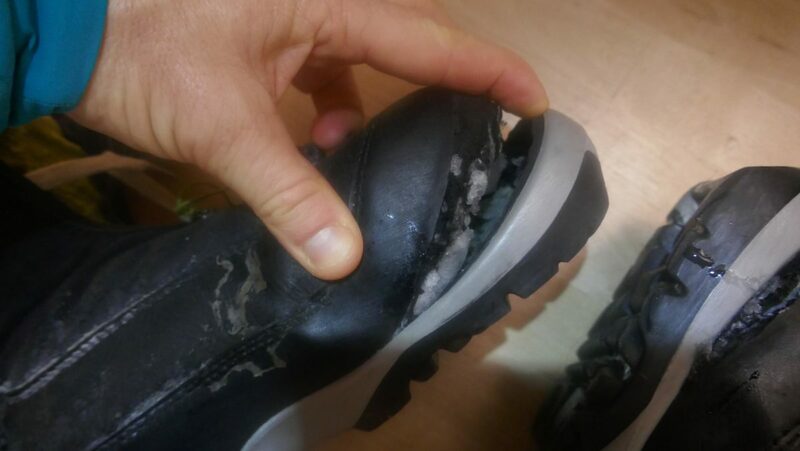 The snow had basically destroyed my boots, and they were beyond repair. As with any situation in the mountains, when something goes wrong it often precipitates other problems or mistakes. So now I had snow I couldn’t ski through barring the way ahead and boots I couldn’t ski in. 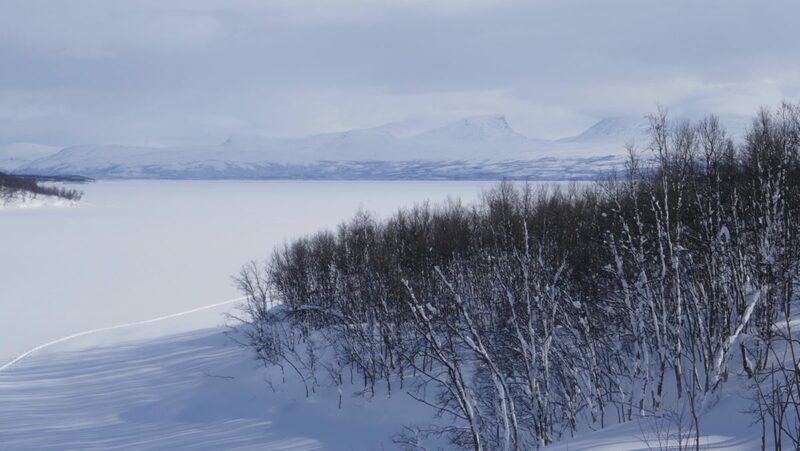 I had to make a quick decision to head back to Abisko and try to find a solution. Luckily I was able to get a new set of boots posted up to me a few days later, giving me time to figure out an alternative route. All in all I’m pretty proud that I was back on track and skiing again three days later. Which was the hardest day and why? This is a tough one, because there were quite a few physically hard days but, as I talked about earlier, the fact I was so engaged with this journey meant that I enjoyed those tough times so they didn’t feel as hard as they could have done. I guess one day really wasn’t very enjoyable because the snow was in terrible condition. 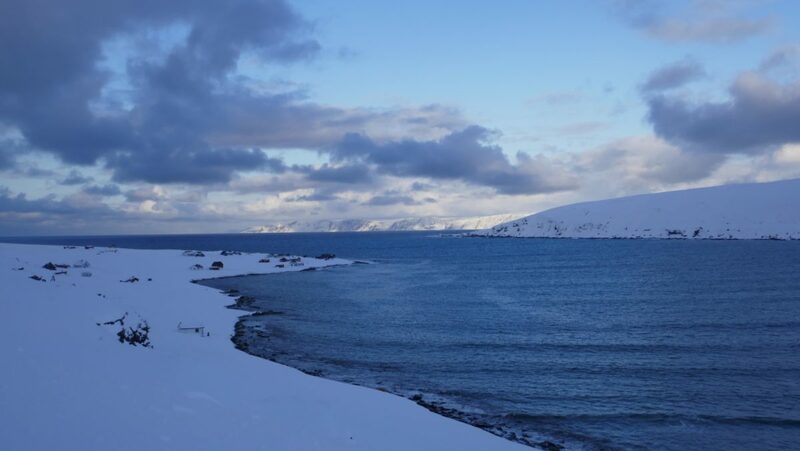 It was the day I “skied” from Lønstua to Bolnastua near Sulitjelma above the Arctic circle. I use inverted commas because it really was survival skiing at best. Most areas of Norway had really good snow cover this year, but for some reason this section had seen very little since late November. Although the cold had preserved what little snow they had, it was sculpted and twisted and pressed into something akin to concrete. There were rocks poking through everywhere. 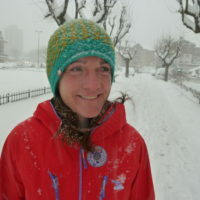 I had to pick a route very carefully, sometimes on skis, sometimes on foot… with a real feeling of tension in my body. You couldn’t relax. Everything seemed to be against me that day and I was seriously worried about getting injured. In the end, though, the day finished rather well. I managed to stay upbeat and keep going and the views were always pretty amazing. When I finally reached the hut I met three really jolly Norwegian gentlemen who were busy building a new hut next door. 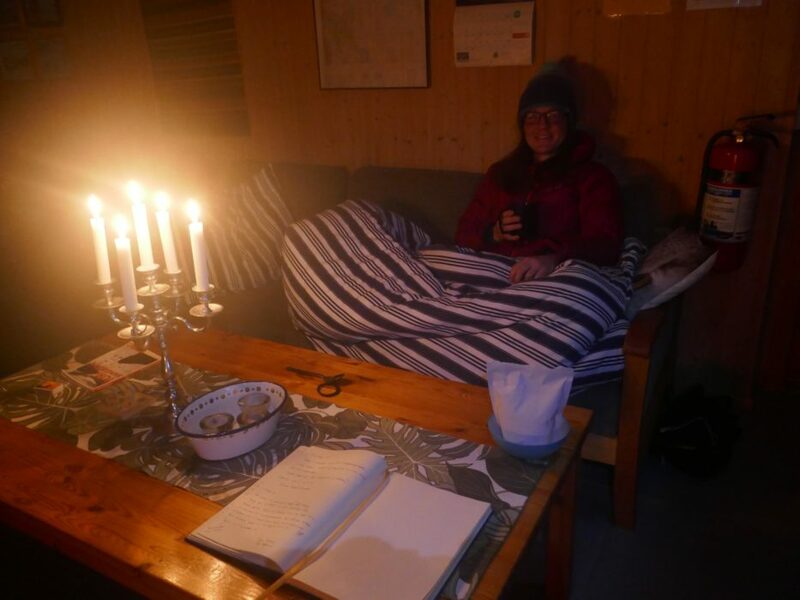 We shared a lovely sociable evening together spinning mountain stories and during the night it snowed which massively improved the conditions. So in the end the day was really good! Is there one stand out “best bit”? Oh my goodness… an even harder question! As you can probably guess there are a lot of really stand out best bits. I look back and I have a real fondness for the very start of my journey. 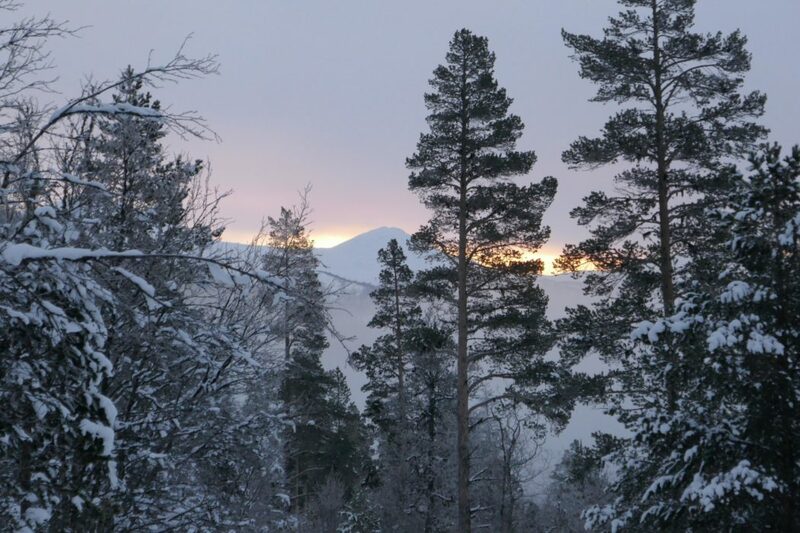 A good friend, Ewen Martin, who took me on my first cross country ski instructor course, lives close to the start. He picked me up from Kristiansands airport and I stayed at his house in Bjelland the night before I started. That someone so key to my development as a cross country skier, a real mentor of mine, helped set me on my way was incredibly special to me. 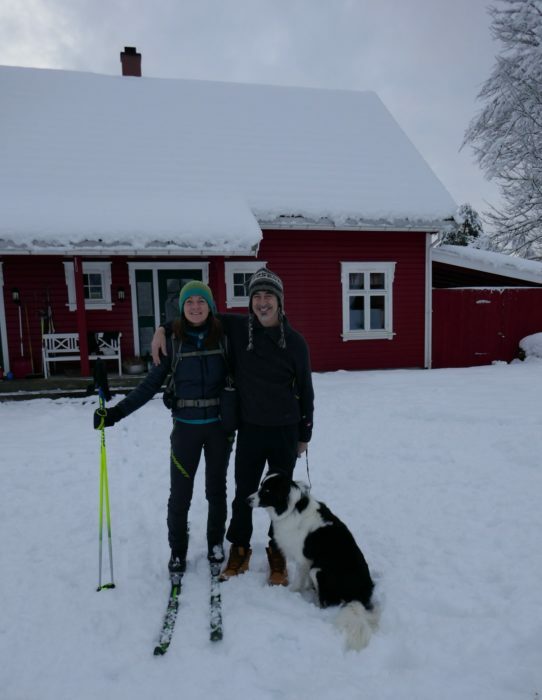 In terms of pure enjoyment I had one day skiing from Vingelin to Rørøs where I simply couldn’t stop grinning; the conditions were just so good. 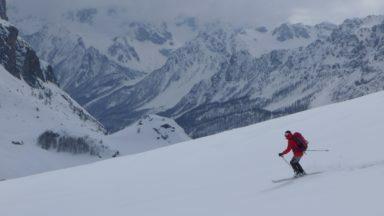 I felt like I could ski forever and I couldn’t believe how special and different each day had been… I still get excited thinking about those moments. 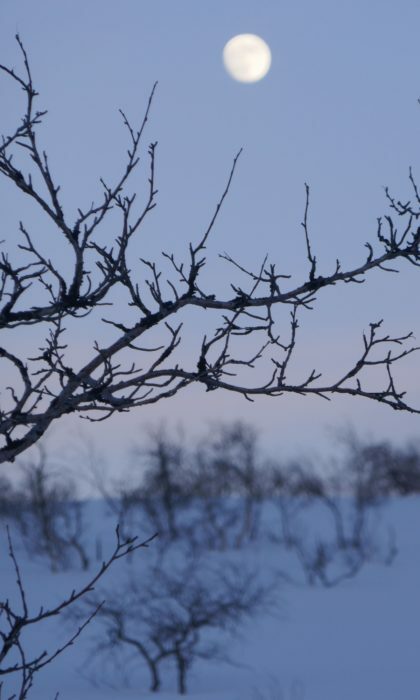 How did you deal with the cold and the darkness? When I started the trip in Lindesnes on the 14th January I had 6 hours of daylight and when I finished on the 5th April at Norkapp I had about 14hrs. I found it fascinating how rapidly the days were lengthening. At the start it meant that I couldn’t take on long days as I didn’t really want to be to skiing in the mountains alone at night. The first three weeks were cold but not extremely so, but I had poor weather, with quite strong wind and poor visibility. 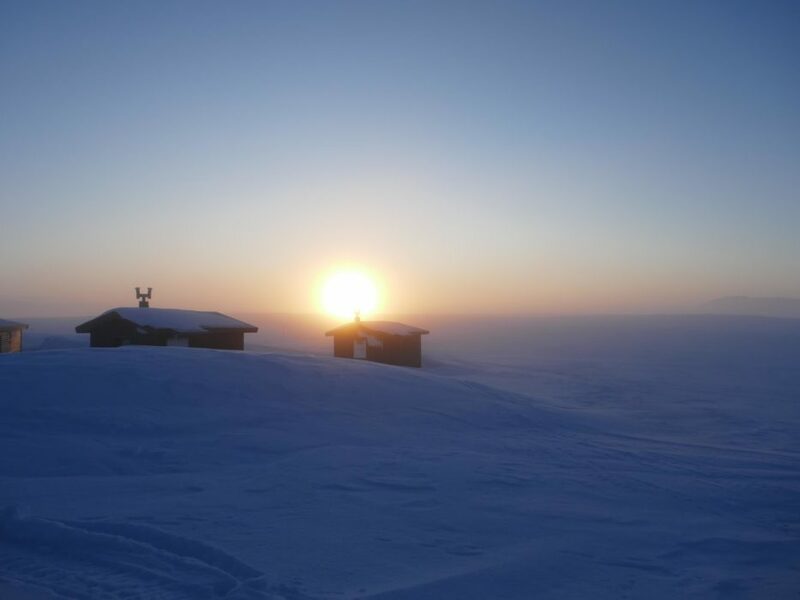 After the third week, the weather improved but the temperatures plummeted… down to -30C and sometimes as low as -40C. It was a dry cold though, so I could keep warm through movement. 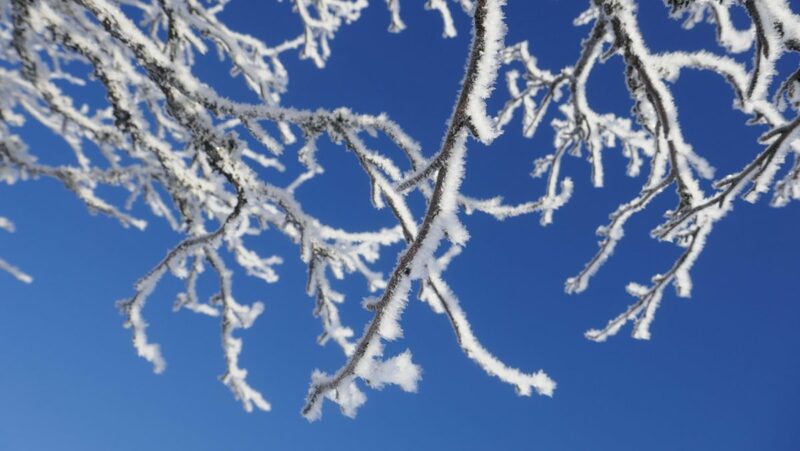 The cold becomes a real problem if it’s combined with wind or if you get injured or fatigued and become immobile. I had emergency equipment with me but fortunately never had to use it. Another side effect of the cold was a massive increase in my appetite… I just couldn’t eat enough to keep warm and developed an uncharacteristic craving for chocolate. Is an undertaking such as this more of a mental than a physical challenge? No… I think it was testing in equal proportions when I look back on the whole journey. I probably make light of how physically tough it was, or rather I put it into the context of what my capabilities are. However, I am beginning to realise that over the years I have continually pushed and trained my body and I am quite good at sustained long distance endurance events - in other words I’m pretty robust. To do this journey, in the style and the timeframe that I did it, you do need a good level of physical robustness. It’s probably the hardest that I have ever pushed myself over a sustained period of time. In terms of the mental side - yes it was definitely challenging at times but, as I mentioned before, the fact that I really wanted to do this meant that I was ready for a fight, I was ready for hardship and so it wasn’t a problem when conditions got tough. 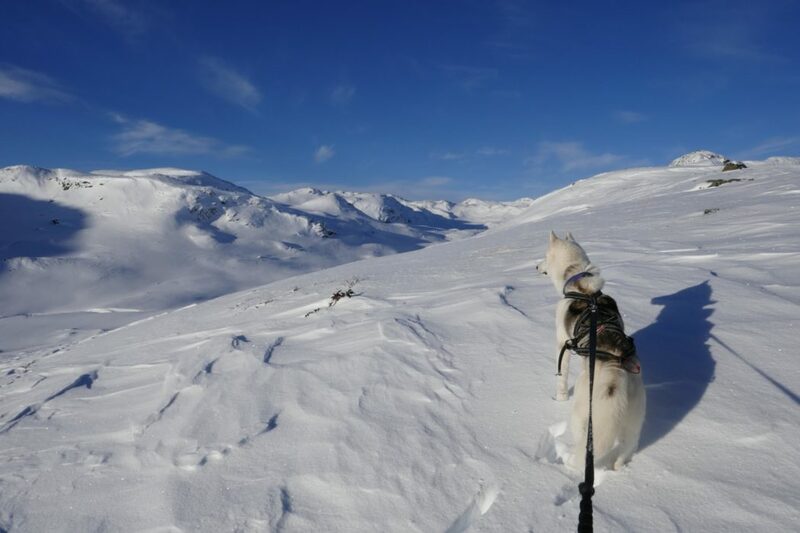 Did you have company whilst you were skiing? I had decided to do this journey solo for various reasons. I like company but I’m also at ease when I’m alone. I like having time to reflect and think, to follow a train of thought through to its conclusion. There is always plenty going on in my head! I can honestly say I was never bored and I was never lonely. There was too much to take in and appreciate for any self-absorption of that kind. 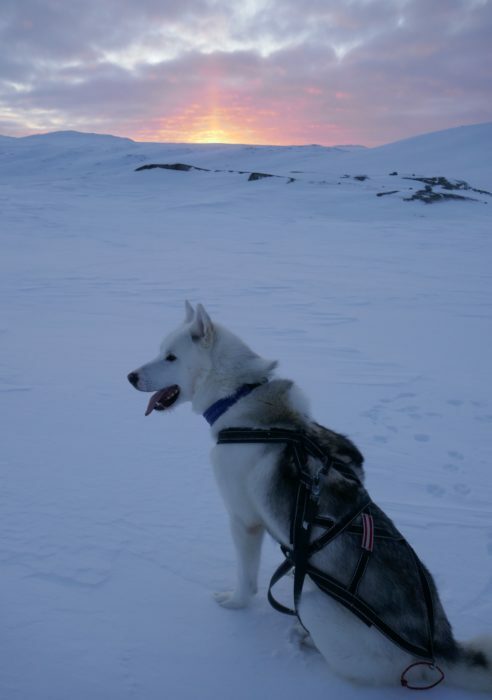 I did ski for ten days with a beautiful and feisty young Greenlandic Husky called Joker though. It was a great experience but I definitely felt more exhausted at the end of it that whilst I was skiing alone. It also highlighted to me how much I dislike having to impose discipline on something or someone else - it is not something that I take pleasure in - even when it’s required! How did you keep in touch with the outside world? In today’s world it is almost more difficult to keep out of touch than it is to keep in touch. I wanted to be focused on the journey and the experience so didn’t want any intrusive dialogue with the outside world or social media. At the same time I wanted to share my journey with family and friends so that it wasn’t an impenetrable story when I returned… I mean 82 days is too much information to describe to people when you return. They only realistically get a summary. So I decided to post one or two photos a day on Instagram together with a short description of my experiences. I enjoy writing so this didn’t become a chore. 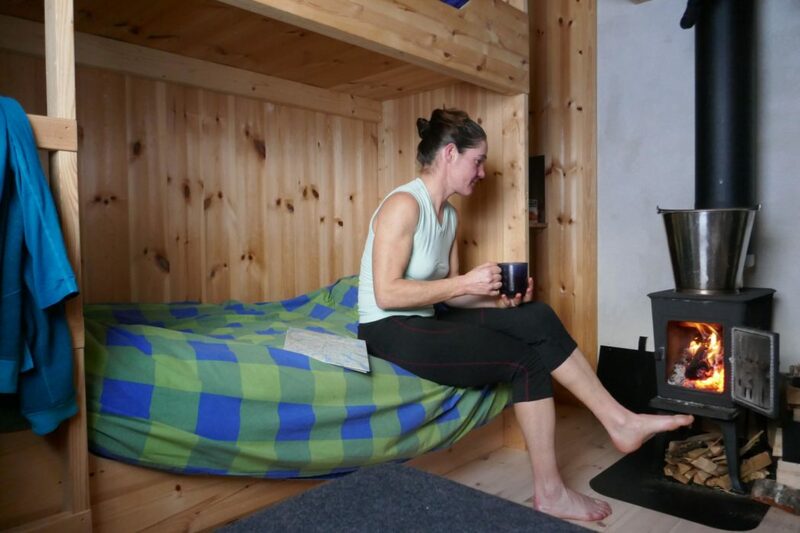 It helped me reflect and remember each day when I was relaxing in the hut each evening. I didn’t have mobile reception every day so I would compose the post offline and then share it when I got a signal. It seemed to work just fine that way. I called my mum a few times whilst on the trip and exchanged a few messages with friends… some of whom sent letters to my resupply drops and someone even sent me a box of Cadburys creme eggs as morale boost! Was there a bit of kit that you used that was indispensable for success? I thought a lot about my equipment and clothing before I started the journey and I am pleased to say that I think I made some very good decisions here. I am fortunate to get clothing sponsorship from Dynafit and Salewa and they provided me with a really good set up clothing wise. It proved perfect for the conditions that I encountered, even the extreme cold, whilst also proving very durable. My skis and poles worked really well too. 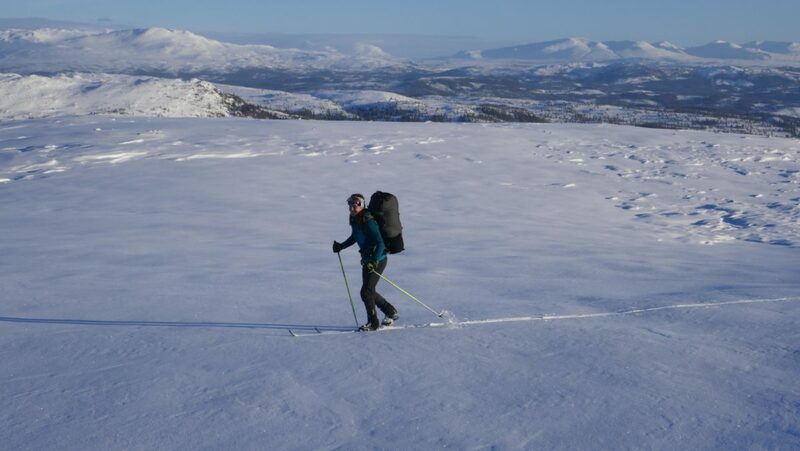 I chose Asne Mountain race 48s with a short skin attachment, and used the Dynafit Speed poles, which are ski mountaineering race poles but are perfect for cross country ski touring as well. They are carbon but with an aluminium section near the tip to cope better with contact with rocks and such like. They were really light and robust - I loved them. My Dynafit Borax over-mitts were a real winner as well. When it got very cold I wore them all the time. I suffer from cold hands so I always ski in mittens. In terms of equipment I took a GPS spot device so that I could send out a signal every night to my family and friends to tell them I had reached safety and stopped skiing for the day. Because I was skiing alone I think that this was an essential bit of kit - I mean if staying in contact isn’t possible then you cope with it, but when you have these emergency devices on the market it would be an unnecessary risk not to take one. It didn’t intrude on my sense of commitment or solitude - but it gave my family a little more peace of mind. So in that respect it was essential. Where did you stay and what did you eat during the challenge? 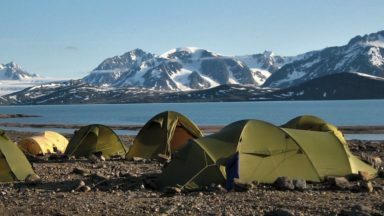 My strategy was always to use the extensive hut system in Norway rather than camp, so I travelled with a rucksack and no pulk (sled). It meant that although I took emergency equipment I didn’t have to carry a tent. 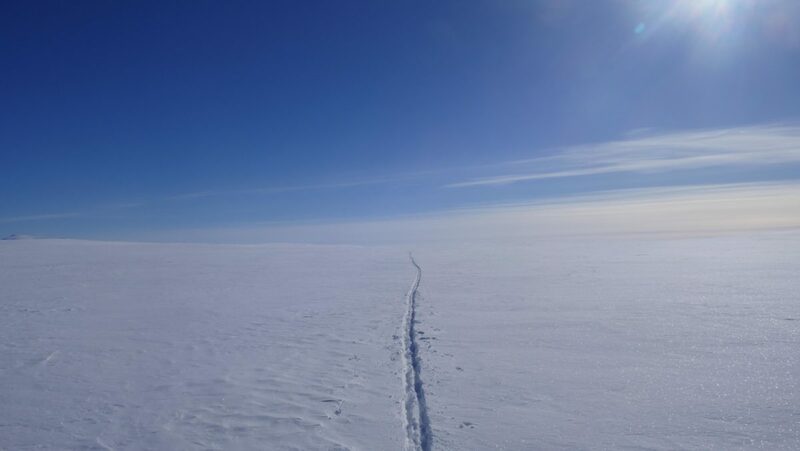 The up-side of this is a saving in weight; the down-side is that I had to be able to ski far enough to reach the next fixed cabin. 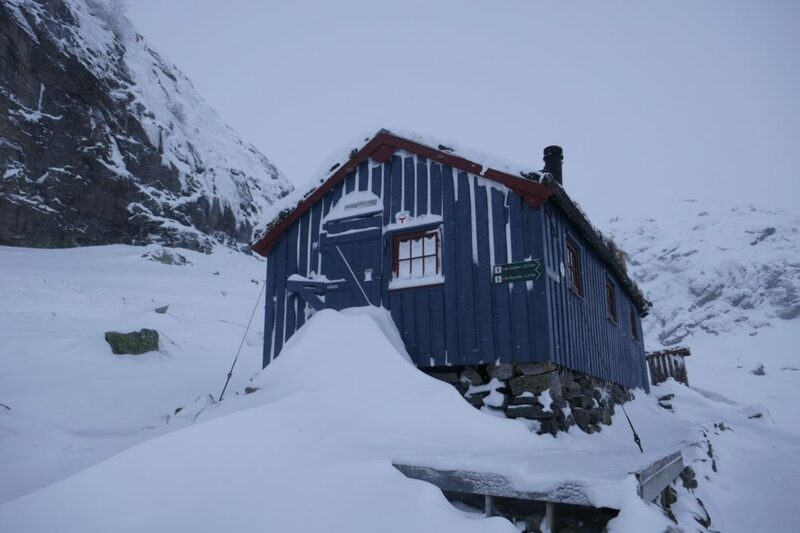 In the south of Norway this isn’t a big problem as there are a lot of huts in the mountains and they are usually about 20-25km apart. 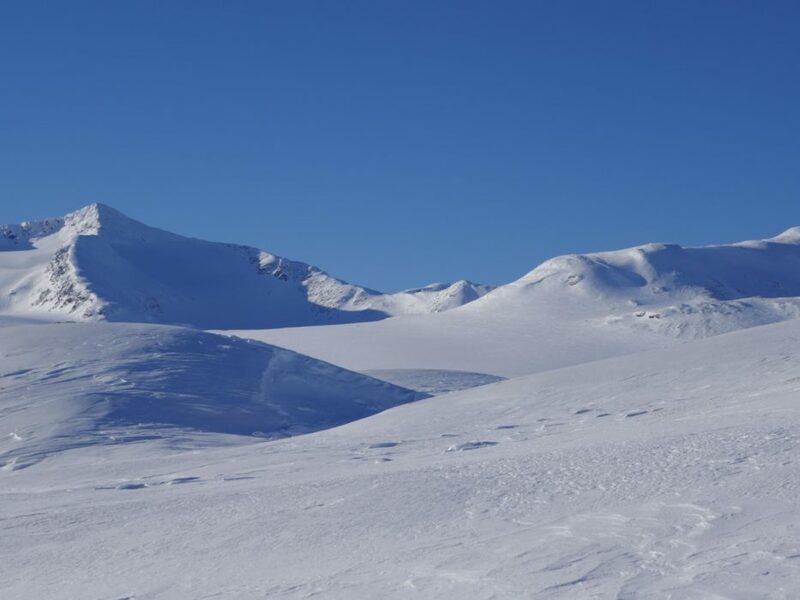 This is a reasonable day tour but still possible even if you have very challenging snow conditions. 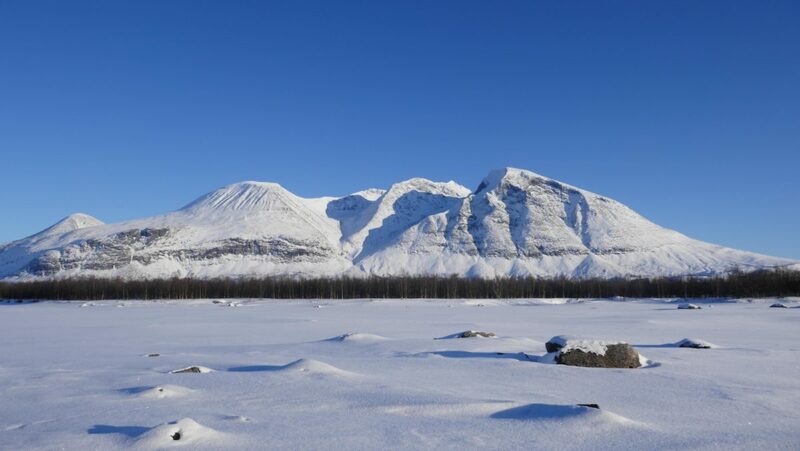 However, the further north you go the fewer cabins there are and the further apart they are. I was carrying about 6 days’ worth of food at a time. 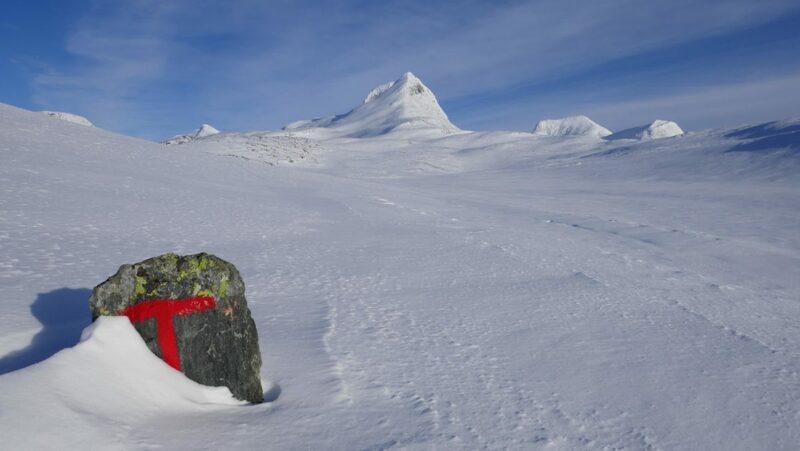 I had identified resupply points along Norway, where I had posted food parcels to myself to collect. These contained dehydrated main meals for the evening, a “brew-kit” of powder drinks and tea bags and some high energy, high protein bars which I used for lunch - not forgetting bags of coconut milk powder to have with my porridge in the morning! Do you feel superhuman or do you think this is something anyone can do with the correct level of preparation? No I’m definitely not superhuman. I am realistic though, about my past experience, physical training, the skills learned from a life spent in the mountains and becoming a Mountain Guide… and how all this contributed to the success of my journey. I was confident that I had the capacities and skills to meet most challenges. There were only a few occasions where I felt I might have overstepped my limit… but in the end that proved not to be the case. So do I feel that anyone could do this? Yes, I do… but they would be advised not to take that as a sign that it was easy. It wasn’t, and anyone thinking of doing a similar thing in a similar style should make sure that they are as well trained and have the right skills for the challenge. Otherwise I think that what I found to be an immensely enjoyable journey they might find a nightmare, and that would be a shame. What do you think you can learn from testing your limits on a challenge like this? I think that when we find the courage to take a risk, to embark on an adventure where the outcome is not certain, we open ourselves up to a process of change - change that we can learn from. Adventure education aims at harnessing that learning process. In the context of understanding yourself, managing your emotional and physical responses to challenge, and understanding your interaction and effect on other people within a team and as a leader. It’s an incredibly powerful and useful medium for positive personal development. The risks we face through physical adventure are perhaps more obvious that those we face in everyday life, but how we respond to them are closely linked. For example if we can learn patience, perseverance, calmness, and a positive mental attitude to overcome challenges in the physical world we can try to apply them to our interactions with others in our everyday lives. 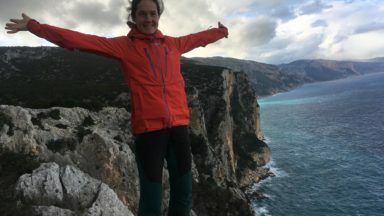 Do you feel more pressure to achieve or to be a role model, being a female adventurer in a predominately male environment? How do you balance this? I can’t say that I really feel a pressure to be a role model, and whatever pressure I feel to achieve is probably more internal than external. My father helped me develop a real sense that anything was possible if you worked hard enough. This isn’t the case for many women. I think our culture sometimes allows women to internalise false boundaries, particularly concerning their physical potential. This can have a detrimental effect on their confidence, mental robustness, outlook and physical health. So I think that it is very important to challenge these false boundaries as early as possible. You were raising money for the Ulysses Trust. How will they benefit from the money you have been able to raise? 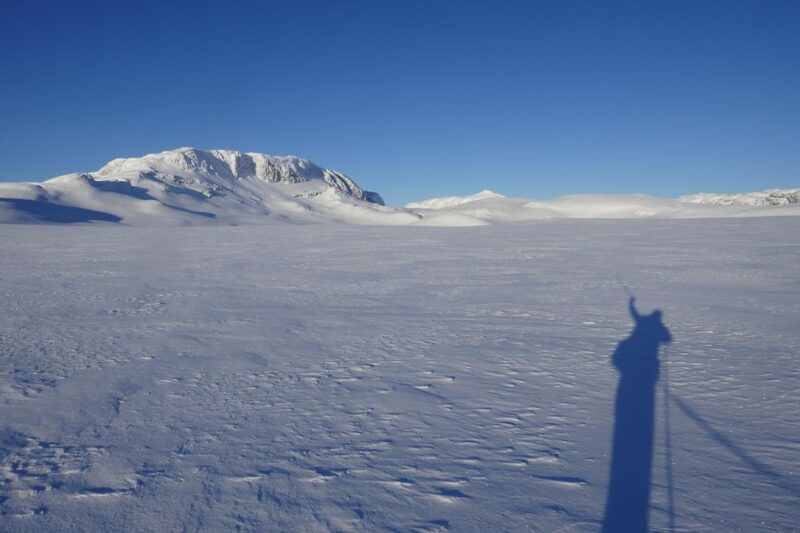 The money I have raised will go towards supporting Cadet Units to organise adventurous expeditions and training courses. Particularly ensuring that no cadet is excluded from such opportunities because their families can’t afford the personal contribution required. These are skills are potentially invaluable to youngsters from disadvantaged backgrounds, or those struggling to deal with difficult life circumstances. By taking them out of the context of those difficulties and helping them develop positive coping mechanisms, mental strength and resilience hopefully they will be able to transfer those skills back to their everyday lives. What’s next (after recovery of course)? The hardest question you’ve asked so far, and my least favourite. This journey has been alive in my imagination for over fifteen years so it’s not easy to immediately find something to replace it. I also don’t want to keep chasing the next big challenge because that feels too heavily focused on the future with the dangerous potential to become a conveyor belt of dissatisfaction. I don’t think that this journey could have been any better for me. I felt like I was the right person in the right place at the right time - and that doesn’t happen often. 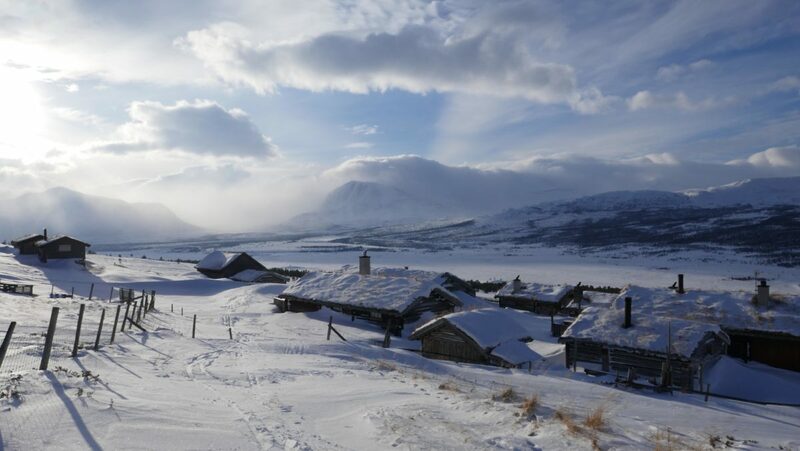 I feel satisfied and content when I look back on an unforgettable winter, of an experience well lived. I hope that I can hold onto those memories and that feeling for the rest of my life. Now you have finished, what would you tell yourself at the start line? This is my favourite question. I told myself to focus on each day and enjoy every single moment because I would only ever live them once. I’d tell myself exactly the same thing again.